Opening for Technology Director – Core Products at Volk Optical Inc.
Utkarsh Sharma has over 15 years of experience in development of innovative optical imaging systems, medical devices, lasers and sensors. He obtained his PhD in Electrical and Computer Engineering at the Johns Hopkins University and BS in Engineering Physics from Indian Institute of Technology (IIT-Bombay). During his doctoral research, he developed novel optical imaging systems and fiber lasers. Post PhD, he worked as research fellow at Harvard Medical School and later at Beckman Institute at the University of Illinois (UIUC), where he continued working towards developing high-speed and high-sensitivity optical imaging systems and laser sources for applications in bio-imaging. Thereafter he worked at Carl Zeiss Meditec, Inc. (Dublin, CA) where he led the projects for developing next generation ophthalmic imaging systems and technologies including development and commercialization of OCT angiography. He lead the Advanced Technology Development Group at Optovue Inc. (Fremont, CA). He is currently VP of Product Development and Strategic Marketing at Volk Optical Inc.
Dr. Sharma has authored more than 45 research publications including peer-reviewed journal articles, book chapters, and articles in conference proceedings. His work has resulted in 23 issued/pending patents in the field of optical imaging and lasers. He has delivered over 12 invited talks at international conferences and technical events. 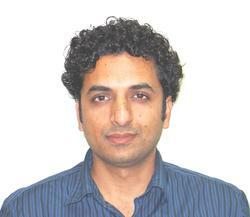 He has been serving as a technical committee planning member for CLEO 2015-17.